As creatives, we have all had that feeling that our muse has abandoned us; that there is a block clogging up our creative energies. We stare at the blinking cursor on the empty page or wait in vain for inspiration to strike the blank canvas. However, we need not wait for inspiration to strike, for it is discipline that that we need to call in to pull us out of being stuck. Discipline is the engine that drives creativity, the spark that keeps the creative fires burning—even if we do not feel like making anything or that we have produced anything of value. Just consider how your discipline and sticking power has gotten you through the creative process—think about how many times you have refined a concept to really get it right, or taken a passing thought and tenaciously honed it into a brilliant idea. Before we jump into how to use discipline as tool to unlock creativity, let’s take a look at where creativity lives in the brain to get the full picture. It is a popular notion that creativity is localized to the right side of the brain and that ‘right-brained’ people are ‘just more creative.’ Wrong. In fact, neuroscientists have characterized creativity by a twofold process. The initial improvisatory phase is defined by spontaneous production of new material, and is followed by a period of focused re-evaluation and revision. A study conducted on rappers during spontaneous improvisation maps what happens in the brain during the initial creative ‘flow’ state. The study debunks the theory that suggests that creativity is confined to the right side of the brain, and confirms that multiple regions are harnessed during creative improvisation. Activity in the medial prefrontal cortex, inferior frontal gyrus (IFG), medial premotor areas, and the amygdala suggests that creativity is associated with a neural network that involves discipline, language, emotion, and motor function. When willpower or discipline is exerted, neuroscientists have identified that activation occurs primarily in the right inferior frontal gyrus (rIFG); therefore, highlighting that regions of creativity and willpower are shared. Research has also revealed that because discipline is a major driving force for creativity, we must exercise it carefully. Here we explore the relationship between discipline and the making process, highlighting what we need to do to make the most of it. Producing a piece of work daily offsets the cognitive burden of having to do something out of the ordinary. If you are creating daily, it becomes part of your routine. You might have heard people say, ‘I just don’t have the willpower to keep that up’, as an excuse not to work. In fact, they are correct in suggesting that willpower is a finite resource, as shown by a study conducted by Joseph Ferrari on DePaul University students. Two groups of students were instructed to solve a difficult puzzle. One group of students was first required to eat radishes while resisting freshly baked cookies given to their peers. When faced with the difficult puzzle, the group of students who had eaten the radishes quickly gave up, while the other group was able to sustain their effort for much longer. The students who had forced themselves to eat the radishes had experienced, what is known as ‘ego depletion’. Ego depletion is a term used to describe what happens after we have used our ‘quota’ of will power. After their first act of self-control, their will-power was reduced and as a result, they had less of it to spend on the puzzle. The students who had not been taxed with self-regulation before solving the puzzle were able to focus more. Another study entitled ‘Self-control as a limited resource: Regulatory depletion patterns documented’, which was published in the Journal of Personality and Social Psychology, asked one group of participants to suppress their emotions while viewing a disturbing video. They were then asked to perform physically taxing tasks. The group who had experienced ego depletion had poorer stamina. These studies all prove that willpower is indeed limited, so being conscious about its use is important, ensuring that you exercise it when it matters the most. Willpower is like a muscle: you use it or lose it. Research has shown that while limited, willpower is a resource that can be developed and harnessed. We can actively build up our reserve so that it does not run out when we are working on an important project. In his TED talk, Princeton neuroscientist Sam Wang discusses ego depletion and how to avoid it, specifically citing evidence indicating that willpower can be transferred from one activity to another. A recent study had subjects train for two weeks on using their non-dominant hand for everyday tasks such as brushing their teeth, opening doors, and using scissors. They also practiced verbal suppression such as speaking only in complete sentences and avoiding slang. The study found these subjects demonstrated improved impulse control on other tasks as a result of their training. Another study found that small acts of self-control helped individuals remain smoke-free. Do not discount the small exercise you do daily as inconsequential. In fact, just showing up to write that daily post or create that daily illustration builds up your willpower reserve so that when you are up until 3am for a week making an important project perfect, you do not run out of ideas or steam. The willpower you build doing small and simple tasks will transfer to the big projects. We learned earlier that the IFG, the region of the brain associated with discipline, is activated during the creative ‘flow’ state. It makes perfect sense why creative geniuses throughout history followed strict routines. Le Corbusier, Tchaikovsky, Dickens, Freud, and Franklin all had specific times during the day when they would create. They intrinsically knew something neuroscience is only just beginning to prove, that setting a creative schedule decreases cognitive burden. And sticking to that schedule builds up reserves that allow us to repeatedly access ‘flow’ state. Showing up every day gives us the opportunity to invoke the muse, to have those genius moments. It does not require a giant production. Sitting down with the aim of writing a daily post, dreaming up a daily illustration, outlining a short story or producing a simple sketch is sufficient. According to designer Charles Eames, there is no such thing as a useless project because it is the ‘germ of new concepts’. Hopefully, a better understanding of the psychology and neuroscience of ‘showing up’ has clarified why just making something every day, no matter how small, is essential. So stop worrying about the results, and just show up. Discipline is the engine that drives creativity. 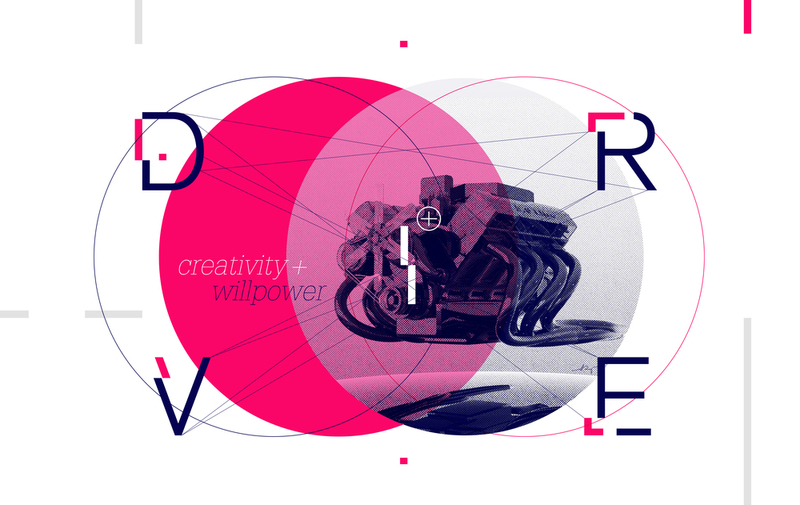 Find out how you can rev that engine and use willpower more strategically to maximize your creative potential.